SAN FRANCISCO, California, December 12, 2013 (ENS) – The Hubble Space Telescope has discovered water vapor erupting in plumes from the frigid surface of Jupiter’s moon Europa near its south pole. Europa is already thought to harbor a liquid ocean beneath its icy crust, making the moon one of the main targets in the search for habitable worlds away from Earth. This new finding is the first observational evidence of water vapor being ejected off the moon’s surface. The water vapor plumes were detected by the Hubble Space Telescope, a collaboration of the U.S. National Aeronautics and Space Agency, NASA, and the European Space Agency, which orbits the Earth 353 miles (569 km) up. Though it is five times farther from the Sun than Earth, and therefore so cold that ice becomes as hard as rock, Jupiter’s moon Europa may be the first place to go to look for extraterrestrial life, NASA scientists say. Ever since Europa was photographed close-up by the Voyager space probe 30 years ago they have thought that the icy crust might cover a subsurface ocean. Where there is water there could be life. The Hubble discovery makes Europa only the second moon in the solar system known to have water vapor plumes. In 2005, plumes of water vapor and dust were detected by NASA’s Cassini orbiter spewing off the surface of the Saturnian moon Enceladus. 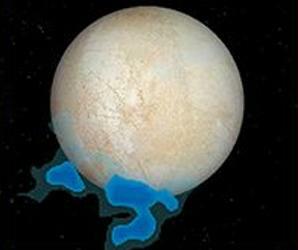 The Europa plumes were discovered by Hubble observations in December 2012. The Space Telescope Imaging Spectrograph detected faint ultraviolet light from an aurora at the moon’s south pole. This aurora is driven by Jupiter’s intense magnetic field, which causes particles to reach such high speeds that they can split the water molecules in the plume when they hit them, resulting in oxygen and hydrogen ions which leave their telltale imprint in the colors of the aurora, the scientists explain. So far, only water vapor has been detected, unlike the plumes on Enceladus, which also contain ice and dust particles. “We pushed Hubble to its limits to see this very faint emission,” said co-lead author and principal investigator of the Hubble observing campaign Joachim Saur of the University of Cologne, Germany. “Only after a particular camera on the Hubble Space Telescope had been repaired on the last servicing mission by the space shuttle did we gain the sensitivity to really search for these plumes,” said Saur. Roth suggests long cracks on Europa’s surface, known as linea, might be venting water vapor into space. Similar fissures have been photographed near Enceladus’s south pole by the Cassini spacecraft. Also like Enceladus, the Hubble team found that the intensity of the plumes varies with Europa’s orbital position. Active geysers have only been seen when the moon is furthest from Jupiter. But the researchers could not detect any sign of venting when Europa is closer to Jupiter. One explanation is that the long fractures in the ice crust experience more stress as gravitational tidal forces push and pull on the moon and so open vents at larger distances from Jupiter. The vents are narrowed or closed when at closest approach to the gas giant planet. Future space probe missions to Europa could confirm that the exact locations and sizes of vents and determine whether they connect to liquid subsurface reservoirs. The existence of these vents is important news for missions such as the European Space Agency’s Jupiter ICY moons Explorer, a mission planned for launch in 2022, which aims to explore both Jupiter and three of its largest moons: Ganymede, Callisto, and Europa. Launched in 1990, the Hubble Space Telescope orbits Earth above the atmosphere, which distorts and blocks the light that reaches our planet, giving it a view of the universe that far surpasses that of ground-based telescopes. 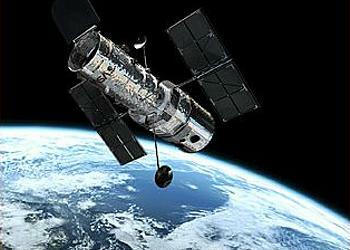 As it travels, Hubble’s mirror captures light and directs it into its science instruments. Every 97 minutes, Hubble completes a spin around Earth, moving at the speed of about five miles per second (8 km per second) – fast enough to travel across the United States in about 10 minutes.